Lombardi Brothers Dental is one of the few dental practices that provide a cone beam CT scan in their Lake Forest office. Most practices have to send their patients to an outside dental imaging center. What is 3D Cone Beam Technology? The cone beam CT scan, operated by expertly trained staff, offers maximum convenience, safety and precision. In some cases, these 3D images allow Drs. Lombardi to detect potential problematic lesions in the head and neck. Computed Tomography (CT) imaging (also referred to as a Computed Axial Tomography or CA scan), is commonly used for diagnostic purposes. It is truly one of the most important dental imaging and diagnostic breakthroughs in modern dentistry. In our Lake Forest/Foothill Ranch office, Drs. 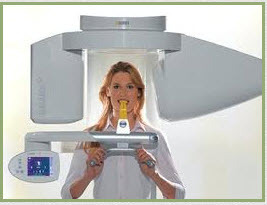 Lombardi use the cone beam CT scan to provide 3D images of the jaw structures and teeth. This dental CAT scan provides extraordinary detail and has become the gold standard for patient care in implant dentistry. Review high-quality images and quickly give patients accurate treatment. Offer patients a much lower X-ray dose than other conventional medical CT equipment, reducing radiation by up to 60 percent. Keep patients relaxed throughout the diagnostic process and treatment phase. Keep patients safer and more comfortable. Provides patients with the best dental care possible. Virtual surgery can be performed and evaluated before actual surgery takes place. The 3D images of the dental CAT scan enables Drs. Lombardi to plan surgery so as to avoid potential damage to nerves and to vital structures, including blood vessels and the sinuses. Precise 3D imaging permits Drs. Lombardi to diagnose from accurate, undistorted, one-to-one images. Three-dimensional imaging also offers the ability to enhance treatment planning, and obtain more consistent patient outcomes. Beyond the clinical aspects, Galileo is a wonderful patient education tool. For the first time patients can see their anatomy in accurate real-life perspectives that allows them to understand their own oral health. This improved comprehension leads to a greater bond between patient and doctor. Patient positioning is quick. In just 14 seconds the scan is complete. The system also includes treatment planning software, integrated implant planning, and the ability to order surgical guides. This means that there will be no surprises when we proceed with your treatment. We chose the Galileo 3D product because of the very low radiation exposure compared to other brands of dental 3D imaging. If you have any questions, concerns, or would like to schedule an appointment, please contact us in our Lake Forest office today. We look forward to providing you with the personal care you deserve.